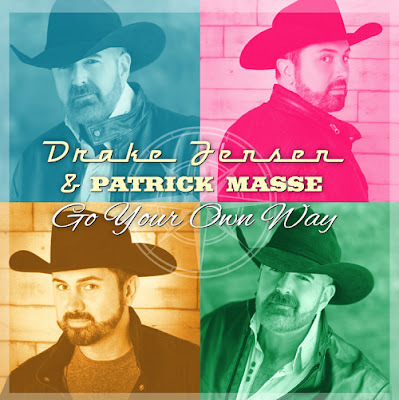 Welcome to my world.... : Out Country Artists Drake Jensen & Patrick Masse Inspire With Upbeat "Go Your Own Way"
Out Country Artists Drake Jensen & Patrick Masse Inspire With Upbeat "Go Your Own Way"
The bright pop-country track has a liberating, anti-bullying message for young people in the closet; and also addresses the imaging in social media that perpetuates “perfection,” feeding a narrative that we aren’t good enough. After just one week, "Go Your Own Way" has landed on the Top 10 Most Active Indies chart. It’s a case of Canadian East meets West as Jensen (from Ottowa) and Masse (from Vancouver) team up for to share a powerful, timely message. Jensen and Masse are refreshingly frank talking about bullying, collaboration within the LGBT community, the impact of religion on young LGBTs and more that motivated the two to record the country anthem. Noting that bullying is especially rampant during school years for young LGBTs. both were asked if either had experienced bullying themselves. "I didn't get to high school," said Jensen. "I had a nervous breakdown when I was 15, and I locked myself in my room for six months. My last day of school was a flash mob beating that lasted about roughly a mile with two guys with boards with nails in them, and a crowd of people of about 75 that gathered around and followed while they bashed me. That was the last day. That was grade nine. There was no more school after that." But the story didn't end there. "I've just recently connected with one of the guys that did that to me on Facebook. It was one of the most surreal things ever, you know? I sent him a message, and I said, 'I see you have children. I hope they don't suffer what I suffered at your hands.'" Referring to his 'Scars' music video which includes statistics about childhood bullying, Jensen told the man, "Thank you very much, though - you've motivated me to do this and help thousands of people." He says he's forgiven the man who admitted facing his own demons, saying "the past is the past." Masse recalls how discussions with co-workers about religion moved him to raise his voice at an early age. "I remember years ago I worked at a big hardware store in Canada called Canadian Tire, and it was one of the first jobs I had out of high school. I was working graveyards; we were doing store audits, and I was with this young girl. Her name was Teresa, and she was a daughter of a pastor, and I was probably the first gay person she ever met." "We would talk, she'd quote the Bible. She would quote this and quote that, and I said to her, 'Well, Teresa, what do you think?' She came back the next night, and said, 'You know, you're the first person, Patrick, who's ever asked me what I think.' I said, 'Doesn't that concern you Teresa? You're 23 years old, and while there's great lessons and values in the Bible, you can't hide behind a Bible and use a Bible to judge other people." "Jesus only ever judged the hypocrites and the Pharisees in his lifetime," adds Masse. "He wouldn't be standing with you. He'd be walking with me because we're all imperfect people here. It's exciting to see that there are true Christians out there that are coming around. I think people are realizing people are people and everybody needs love, right? Everybody needs acceptance."